To begin the process of replacing the hard drive on MILLPWR, you first need to identify the motherboard. 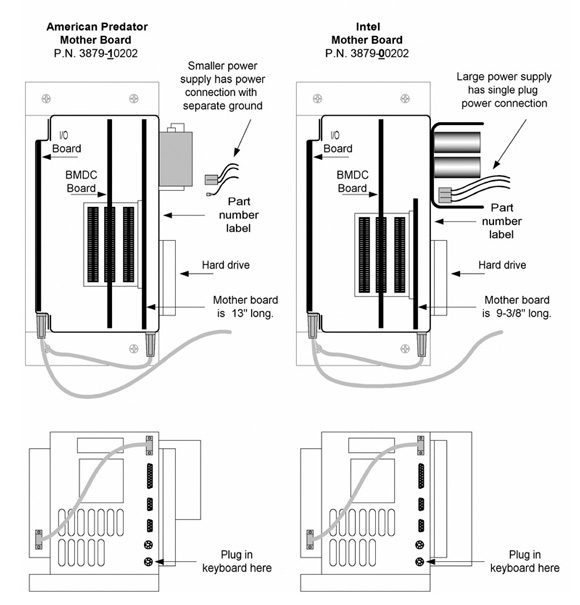 Use the drawing below as a guide, then follow the procedure for that brand of motherboard. American Predator Mother Board (13” Long Board). Mount the Hard Drive and connect the power and communication cables. Plug a keyboard into the PS-2 (round) connector port located on the bottom face of the Electronic Control Module, furthest back from the front. The port you want is the one closest to the rear mounting plate (the other port is for a mouse and will not work). In the first setup window, make sure “Standard” is highlighted (use arrow keys on keyboard to highlight Standard if necessary) and press Enter. C. “Master” Ensure “User” is selected (if not scroll down, using arrow key, to select User and then press the Esc key). Press Esc to return to setup screen. Press the right arrow key to highlight “Advanced” and press the enter key. Press Tab until “Detect Master” is highlighted, and press Enter. The hard drive model should be displayed. Press Esc to leave “Setup” Mode. Using the arrow keys, select the “Save Changes and Exit” option. Press Enter. The system will reboot. Keep the floppy in the A: drive. The screen should return to the A:\> prompt. If, during the reboot process you are asked to “Enter New Time and /or Date”, press enter to accept the values listed or enter the correct time/date and then press the “Enter” key. does, use the number suggested by Fdisk. Follow the screen prompts, when required, to create the partition. Some versions will require you to “save and exit” using specific key presses as part of the operation. Other versions of Fdisk will ask you to reboot the system. Follow the procedure necessary for you to “save and exit” the Fdisk program. When you are back to the A:\> prompt, cycle power to the MILLPWR System, leaving the bootable disk in the floppy drive. If during the reboot process you are asked to “Enter New Time and /or Date”, press enter to accept the values listed or enter the correct time/date and then press the “Enter” key. When the system once again has returned to the A:\> prompt, type Format c:/s and press the enter key. If you are asked to enter a volume label, just press enter, the volume label is not required by MILLPWR. When formatting is complete, remove disk from the floppy drive and the keyboard from the electronics module. Insert your current version of MILLPWR software into the floppy drive and cycle power. After the MILLPWR software is loaded, remove the MILLPWR Disk and store it in a safe location. Your MILLPWR should now be fully functional. Set the “Type” to Type 2. Enter the following values for the Drive you have installed. Cylinders (for drives that have more than 1024 cylinders, enter 1024). For the PRE and LZ parameters enter 0. Press Esc to leave “Set Up” Mode. Press F4 to Save Changes and Exit. accept the values listed or enter the correct time/date and then press the “Enter” key.